for $1,249,000 with 3 bedrooms and 2 full baths. 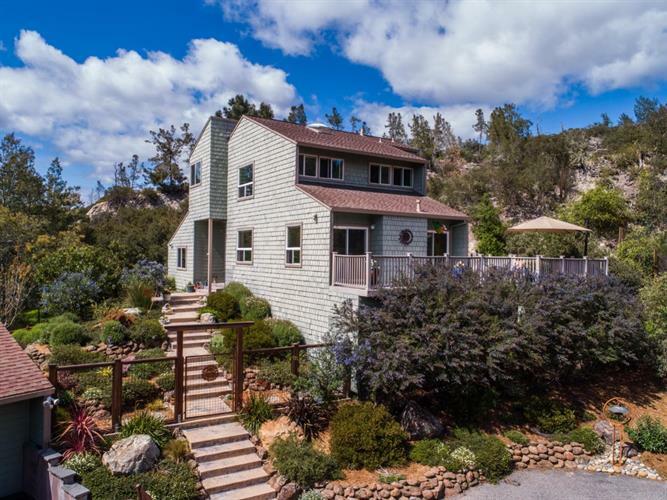 This 2,272 square foot home was built in 1986 on a lot size of 0.982 Acre(s). This is the home you have been dreaming of! Immaculate, unique contemporary home in its own private canyon with vistas, spectacular landscaping features and legal detached studio man- cave facing it's own private garden with hot tub. Perfect commute location for that get away country home, within walking distance to all Ben Lomond offers, in easy proximity to everything Santa Cruz just minutes away. Plenty of parking and end of road privacy, this property will wow your senses and bring lasting enjoyment close to nature with the upmarket sophistication you are looking for. Meticulously maintained w custom design updates throughout. Stunning mountain views from all rooms, open floor plan concept, updated kitchen/dining living room w oak hardwood floors, exceptionally large master bedroom suite w walk in closet. Roomy deck off living area for entertaining, bonus storage room under house, separate legal 1000sf workshop w office space, sunny and lightfilled sanctuary.. welcome home to stay!